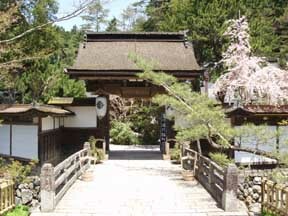 Temple Lodging in Japan "Sanbo-in"
This temple started when the mother of Priest Kobo lived in Jison-in at Kudoyama at the foot of Mount Koya and founded Ichiu, which was later transferred to Mount Koya. So, this shukubo has such a long history. The Hokumen Taishi statue, an important cultural asset, is worth seeing. Also in the precinct, you may happen to see a forest green tree frog bearing eggs. In June, the iris gracilipes are in full bloom. Thus, it is favored by rich natural surroundings. The head priest is a master who has fulfilled formal Gumonji training. 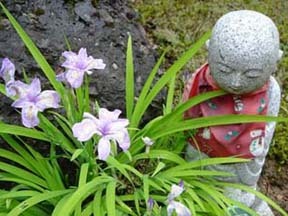 Gumonji is formally called Kokuzo Gumonji Method and is training of chanting "Shingon (true words)" one million times, which became the origin of Priest Kobo. This priest confined himself in Tairyu-ji temple in Awa for 50 days and chanted the phrase 20,000 times a day (a total of one million times) eating only once a day. Accordingly, he fulfilled the training. According to him, it was so hard that he lost 13 kg by the end. 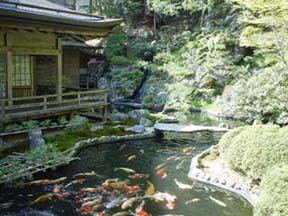 In autumn, they hold a concert in the temple. The autumn moon charity concert at Sanbo-in started as a memorial to the victims of the Hanshin-Awaji Earthquake, but now they hold it every year to dedicate condolences to all the spirits in heaven as we still have tragedies such as 9/11 terrorist attacks and continuous wars and conflicts on earth. I was looking forward to the collaboration of Niko and Syomyo in the temple garden on a moonlit night, which really matches my tastes. It was as wonderful as I expected or I should say, even more than I expected. At the edge of the main hall, there stood 12 priests who came from the temples hit by the earthquake (temples in Kobe, Nishinomiya and Takarazuka) and those from To-ji temple. The Niko tune played by Ms. Wei Wei Wuu (a very charming woman) and Syomyo mixed in harmony, producing a solemn and mysterious time and space. In the later half, the Niko was played with a guitar accompaniment. In addition to well-known tunes such as Scarborough Fair, Soshu-Yakyoku as well as the original tunes of Ms. Wei Wei Wuu were also played. Hand clapping and encore calls naturally occurred for her wonderful performance. After the concert, we had tea and sweets in a leisurely manner. I was able to see the statue of Hokumen Taishi. The bright moon above the main hall, the wind that travels through Mount Koya in September, the heart-moving music and Syomyo. All were wonderful and it became a night that I will never forget throughout my life. The next morning at 5:30, an announcement was aired to inform us about the morning religious service starting from 6:00 in the main hall. Guests are free to participate. It seems almost everyone attended the service. All the people at Sanbo-in were very gentle and kind. In spite of the fact that they were extremely busy with the concert event, they accommodated us with smiles and provided us with a comfortable stay. The Shuin-cho (a notebook for collecting the autographs of temple and shrine priests) I had handed over beforehand was returned at the time of breakfast. The priest gave me his autograph in spite of the fact that he was very tired and so was his handwriting. But he said, "That was the best one recently", which proved his sense of humor. As for the meals, we ate shojin vegetarian cuisine in the large hall. The dinner dishes included shojin style deep fry, hotpot and mixed vegetables as well as sesame tofu. As for breakfast, the hiryuzu (fried tofu with chopped vegetables inside, cooked in bonito soup seasoned with soy sauce) was really juicy and tasty. The bath was a ceramic hot spring and you are free to bathe any time of the day. Check-in time is 16:00 and check out-time is 10:00. 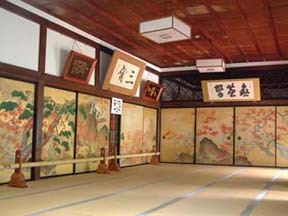 A yukata robe, a face towel and a toothbrush and toothpaste were provided in the room. On the second day, I went to worship at Oku-no-In and bought a hand towel of a picture sutra.